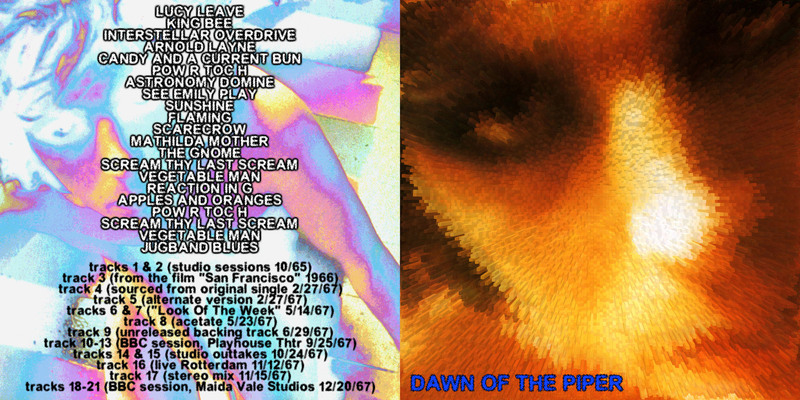 HARVESTED proudly presents for your weeding and listening pleasure, "Dawn Of The Piper." Here's a little bit of info about this release. 1st one I bought...."Unforgotten Hero" (which was released as a picture disc on VINYL). of this?) and they were my best sources at the time (this was about 5 years ago). the best from all these new sources and compile them onto one CD to represent this time period. include all 3 versions of VegMan or other titles which had different stereo and mono versions. be made as to what would be included. anything I have previously heard (which does not come from a RoIO source). This alternate lyric version was sourced from the Rhamadam RoIO. master from a more recent broadcast.....can't get too much better than this! little sound effect. Better than the Rhamadam RoIO. whistle which can be heard during the song. bit EQ'ing, and cleverly replacing missing notes at the start of some songs (Scarecrow). often rejected) is usually our longest process. these stereo versions. STLS even includes the countdown and post-song gibberish. I chose this cool jam session to be included. A low gen tape source was used for the Floyd's final BBC session with Syd. spine. A perfect way to end the CD.